What are some of the factors to think about when considering whether a foreign-sourced wood would be suitable for a project? ~ First in my mind is whether you can find a local wood that could be substituted to similar effect. ~ Second, is the wood harvested at a sustainable rate so that the species can continue to reproduce and not be exhausted? ~ Third, how does the harvesting impact habitats for wildlife and indigenous peoples (both the removal of individual trees and the methods used for harvesting)? ~ And finally, if the wood has to travel from a far away country, what are the impacts of the fuel used to get that wood to me? Being a wood junky, I have to say that the look and feel of exotic woods are such a pleasure to work with – partly because they are different from the woods I use everyday. And for small projects like this memorial wooden urn, I let my heart make the decision on which kind of wood I think my dear friend would have loved her ashes to rest in. However, for larger projects such as hardwood floors and full cabinetry, I invite everyone to think deeply about the impacts of your wood choices. Sometimes wood from one country is vulnerable or restricted, but the same type of wood from another country isn’t. 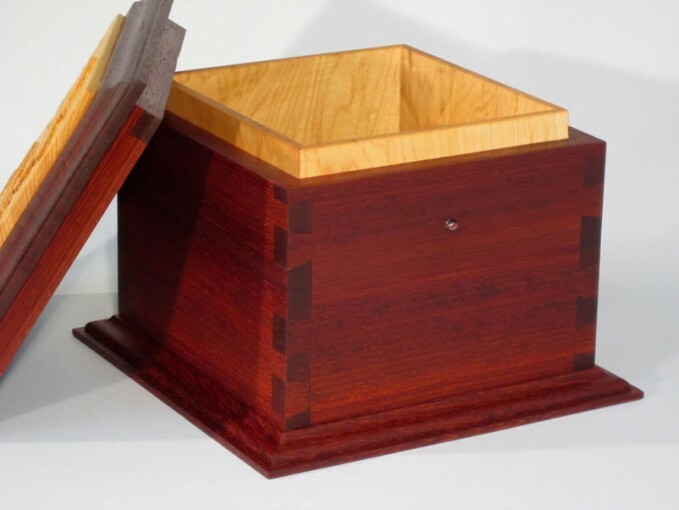 For example, African Padauk is not endangered, but Andaman Padauk is endangered. If you want to quickly check whether your dream wood is likely endangered or restricted, visit this web site for a brief overview. For a more in-depth search, check out the Convention on International Trade of Endangered Species or the International Union for Conservation of Nature.